Running backs at Oregon are held to an elite standard. The Ducks have a history of churning out 1,000-yard rushers like Alabama churns out titles. 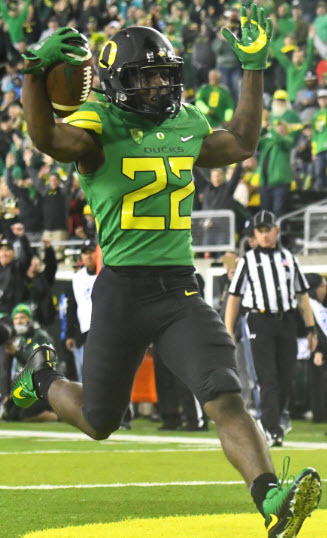 Recent Oregon greats include Jonathan Stewart, Legarrette Blount, LaMichael James, Kenjon Barner and Royce Freeman — some of the most prolific running backs in the country this century. And Freeman, the most recent superstar running back, just finished off a career that made him the the sixth-leading rusher in college football history. With Freeman off to the NFL, the Ducks have the difficult task of finding his replacement. Luckily, the cupboard is far from bare. The question is, which player will take the mantle and carry the load in 2018? 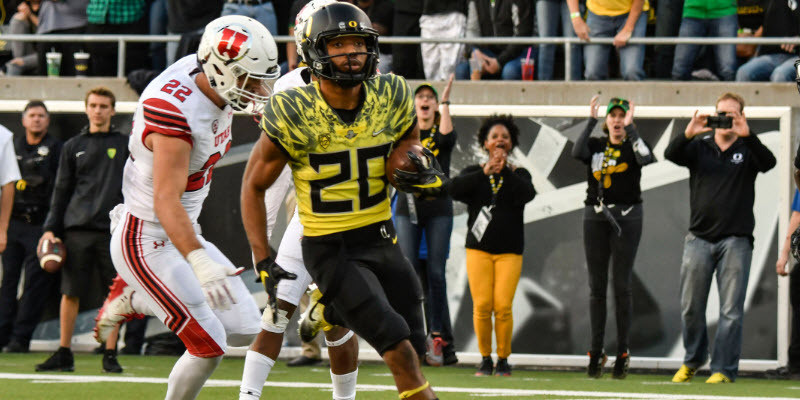 Let’s take a look at the candidates and predict which one will join the list of legendary Oregon running backs. Senior Tony Brooks-James served as the “Robin” to Freeman’s “Batman” the past three seasons. When the Ducks needed a change of pace from the steamrolling Freeman, they turned to the speedster from Gainesville. Tony Brooks-James is the favorite to start at running back in 2018. Brooks-James has spent his time punishing defenses with his blistering speed and superior athleticism. He’s listed as the second-fastest player in the country, according to both Bleacher Report and NFL.com. This is easily corroborated by a quick look at his highlight tape. When he’s on the field, there’s always a chance that a routine handoff can turn into an explosive play. What’s more, he’s not just an ex-track star who plays football. He has grown into a legitimate top-flight running back, whose athletic ability has translated to the field. In his career, he has accumulated more than 1,500 yards from scrimmage, scored 16 touchdowns from scrimmage and even added a kickoff return for a touchdown in 2017. His efforts have earned him a spot on the Doak Walker Award Watch List, an award that recognizes the top running back in college football. With his experience and success to this point, Brooks-James is the favorite to start in 2018. However, his diminutive size is cause for concern. He’s 5’9, 190 soaking wet and with cleats on — a liability that has led to several injuries throughout his career. Many wonder if he will be able to handle the load as the full-time ball carrier in Cristobal’s physical rushing offense. Still, his game-breaking abilities are tough to ignore. If his body can handle the pounding that comes with being an every-down back, he is easily the favorite to succeed Freeman. Last season, there was a freshman running back who was turning heads in practice before an injury stopped him from seeing any in-game action. 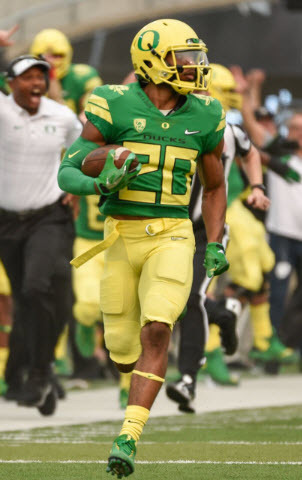 This running back stole the show in the Ducks’ 2018 spring game, leading the team in rushing yards and scoring two touchdowns. His name is CJ Verdell, and he has his sights set on the starting job this season. 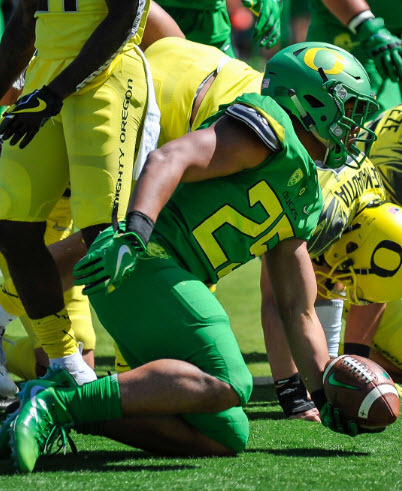 CJ Verdell impressed in the Ducks’ 2018 spring game. Verdell doesn’t share Brooks-James’ track speed, but he does have the size needed to handle the rigors of Cristobal’s offense, along with other promising attributes that make him an attractive option. During the spring game, he made decisive reads, showed off an explosive burst, and used his power to run through contact — critical traits that the best running backs possess. His skill-set is an ideal fit in the Ducks’ new-look pistol offense. Apparently, the coaching staff agrees: according to 247Sports, he has taken his share of reps with the first team during fall camp. He isn’t the favorite to take over as the lead back until 2019, but if he stays on his current trajectory, he may be getting a crack at the starting job earlier than anticipated. Darrian Felix is an elite athlete with collegiate experience. Senior Taj Griffin is a former blue-chip recruit who was once thought to be the heir apparent to De’Anthony Thomas. He has moved from position to position and struggled to find a role, but now that he is practicing exclusively at running back, this may be the season he is able to put everything together and live up to his lofty expectations. Perhaps the biggest sleeper is Darrian Felix. Felix is the only tailback besides Brooks-James and Griffin with on-field experience, and he’s got quite a bit of talent as well: at the Opening in 2016, he had the top SPARQ rating at his position (139.38). He’s a change-of-pace back in the mold of Brooks-James, but with much less tread on his tires. His talent and fresh legs make him an intriguing option. Another member from the same recruiting class, Cyrus Habibi-Likio, is the biggest of the Ducks’ running backs at 6’1, 207. He’s a physical runner who is powerful enough to earn tough yards between the tackles, and he also has enough speed to break some long runs. He’s buried on the depth chart right now, but he may be able to find a role as a short-yardage back. Travis Dye will find a role before his Oregon career comes to an end. Finally, newcomer Travis Dye certainly has the bloodlines. 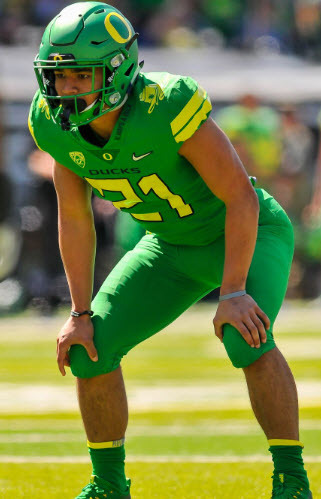 He’s the younger brother of star linebacker Troy Dye, and a fine player in his own right. He lacks the elite athleticism of some of the other backs, but he makes up for it with feisty competitiveness and grit. His spring game film was some of the most entertaining to watch. He’s a throwback runner with a nasty streak. It may be tough for him to crack the rotation in 2018, but expect to see him on the field in upcoming seasons. Expect the Ducks to use a running-back-by-committee approach in 2018. Brooks-James should be the day one starter, but it will be difficult for him to play the entire season if he carries the ball more than 15 times a game. Verdell has the perfect blend of size, power and explosiveness to wreak havoc in Cristobal’s offense. His spring game performance continued to perpetuate his hype, and it will be tough to keep him off the field. The bottom line is that the Ducks have a deep stable of backs, who are each capable of stepping in and attacking defenses in a variety of ways. It’s safe to say that the Ducks’ history of producing elite running backs won’t end any time soon.